That doesn’t sound nice now, does it? The skin is more than the birthday suit you wore the day you were conceived into the world. It is the layer that protects you from so many hazards and germs, including the scorching sun! A healthy skin makes you beautiful, radiant, glowing and full of life. It also reduces the rate at which you age, so if you want your skin to be healthy by simply using natural and enjoyable methods, then read on! “Everything has its beauty, but not everyone sees it” believe it or not you can gain a healthy skin by simply using natural based smoothies! 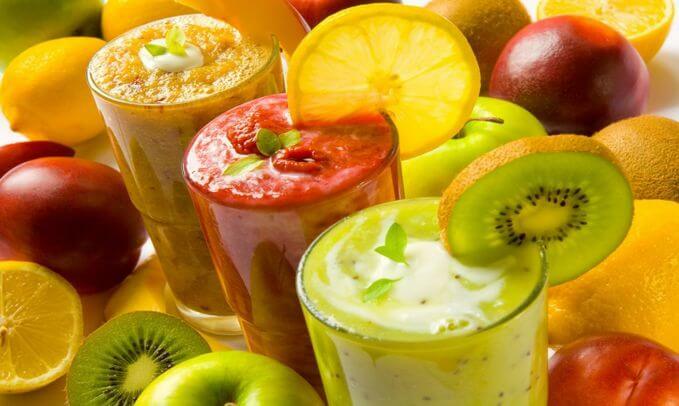 Below is a list of 20 smoothies which will guarantee you a healthy skin. Using this natural based smoothie will ensure you have a skin that glows, as kale is known for its anti-oxidation benefits. It also serves as a stress reliever, clears up spots and wrinkles. Kale is the main content of this smoothie which is enriched in minerals and vitamins; you can throw in a banana, seedless grapes, chia seeds, spinach leaves, and an orange to spice things up. Coconut is one of the main natural based beauty products in the beauty market today, from beautifying the skin to giving you a silky long healthy hair, coconut remains a beauty secret that has been passed down from generations. Using this smoothie will ensure skin regrowth and repair as coconut is rich in vitamin E. This smoothie has a very explicit taste and therefore can be taken like that or with added fruits. Avocados are a great remedy for skin inflammation as they contain a broad range of vitamins and minerals, such as vitamins C, E and K which serves as an antioxidant agent. Using this smoothie not only guarantees you a healthy skin but also serves as a repairing and cleansing agent for those who are heavy smokers. As the name implies, this smoothie has contained in it minerals and nutrients which will see to a clearer and brighter skin tone. This smoothie is a great source of omega three and six acids thanks to the hemp seeds content, which serves as the main ingredient. Some other items contained in this are Dandelion greens which will help in cleaning away toxic substances from your body. You could mash this up with an avocado for greater beauty benefits. One major facial problem women face is acne. Acne could be a pain in the behind if not kept at bay. This is where the mango smoothie comes into play, as mango has been proven to keep acne away by boosting one’s hydration. Apart from giving you a clear skin by treating acne, a mango smoothie a day could be a good anti-aging drug, as it fights against wrinkles. The green metabolism smoothie is not only a great source of a healthy skin, it also serves as a fat loss smoothie, as it boosts one’s metabolism rate, it is great for the eyes, hair growth and has many nutritional benefits. You can never go wrong with this smoothie. It is a keeper. This smoothie contains two fruits which are very active when it comes to beautifying the skin and giving you that healthy glow. Strawberries and cucumbers form the basis of this powerful mixture; you will receive antioxidants from the strawberries and hydrate your skin thanks to the cucumber content. The taste of this is heavenly, as the sweet sharp taste of strawberries combines with the laid back cucumber juice. Superb! Green tea has its own health benefits already, from being a great anti-aging medicine, and antioxidant, you will receive benefits from both ends. The smoothie is made using green tea and honey. For those looking for both a healthy and anti-aging smoothie, this is the best go-to option! This smoothie can be made using either milk or can be substituted with hemp milk. Although for best results, it is best if you use the hemp milk, because dairy could easily irritate the skin of most people. Just toss in a relevant amount of kale, coconut water or milk, a medium sized pear with some other preferences and you have got yourself a healthy fruit shake perfect for your skin and health in general. Chia is the main ingredient of this smoothie; the seeds contain minerals and nutrients which are great for the skin. Packed with Omega-3 acids this smoothie will keep your skin hydrated at all times, heal skin dryness and itchy spots (This is a healing smoothie!). Chia seed smoothie is packed full of various minerals and vitamins which will guarantee you a strong, firm and healthy skin. This is a tropical smoothie which has contained in it vitamins and minerals which are great for the skin. Flaxseed oil is the main content of this smoothie, all you will need to make this nutritious drink are; a medium sized apple, orange juice, yogurt, milk, and of course, flaxseed oil. Pumpkin has so many nutritional values; it is more than that unfortunate vegetable that is taken advantage of every Halloween. Pumpkins contain carotene which is later converted into vitamin A, which is an essential vitamin when talking about cell growth and skin health. You do not have to wait for Halloween to go pumpkin shopping, grab that cart and go fetch yourself a healthy skin! This smoothie is perfection, both from the taste to the nutritional content. Berries are known for their sweet taste and high vitamin C content. Vitamin C is important for a healthy skin. It aids in skin complexion and tone. This smoothie has contained in it avocado, oranges and hemp which are great sources of vitamin C. your skin will be hydrated, full of nutrients and firm after indulging in this delicious beauty drink. This smoothie is a two-edged sword which has contained in it both cucumber and cilantro. The combination of this two will see to a refreshed, glowing and totally healthy skin. The cucumber serves as an antioxidant, while the cilantro helps in fighting acne, fungi, and eczema. Carrot and papaya are two great sources of carotene, which is good for the skin, as it is converted into vitamin A which is great for the skin tone and color. It will be great if you could indulge in this thrice a week! Watermelon smoothie is a great way to detoxify the skin and hydrate it all at the same time! This smoothie will guarantee you a bright, clear and smooth skin. This smoothie is great for the summer time. It is packed with health benefits which are essential for the skin. This pineapple and goji smoothie should be on the list of everyone seeking a healthy and glowing skin naturally. Pineapple is packed with both vitamin C and is a great antioxidant agent. This is essentially a combination of so many fruits to form a super smoothie, packed with nutrients which are great for the skin. From the cucumbers to the chia seeds, apple, pineapples, oranges, hemp oil and as many fruits you could garner. As long as it benefits the skin, throw it in there and shake it up! Carrot and Mangoes are fruits which are high in vitamins and minerals essential for a healthy skin. This smoothie will give you a healthy skin and improve your skin color as it is packed full of vitamin A and C.
There are so many things we have no control over, like the rate at which we age, our height and the family we want, but there are some things which can be controlled to an extent like our skin. The skin is not that hard to maintain, it is our duty as human beings to be hygienic and conscious of what happens in our body. Drugs and supplements are not always the best way to obtain a healthy skin which is why I urge you to go fruit and vegetable shopping today, bag yourself that healthy skin you have always wanted by making these nutritious smoothies listed above!